If the CRANK films were visually exhausting, then GAMER is a clear case of visual abuse and ROBERT WILLIAMSON and GEOFF ZANELLI's score is just as guilty, but against our ears instead. In GAMER, we are once again taken down the path of an incarcerated man being able to obtain his freedom by winning some outlandish game or sport. In their respective eras, both DEATH RACE and THE RUNNING MAN asked the audience the same question, "Could this be where we are headed for our entertainment?" Hmmm. Yes. It could very well be where we are headed. Certainly nothing new about the question or it's answer. It has been asked since the age of the Roman Gladiator came to an end and the answer remains unchanged. Since we are now in the "age of the video game," perhaps the writer/directors felt it was time to re-wrap and present this question for a new generation. Or perhaps Neveldine and Taylor just needed some sort of premise to hang another couple hours of visual nonsense on. 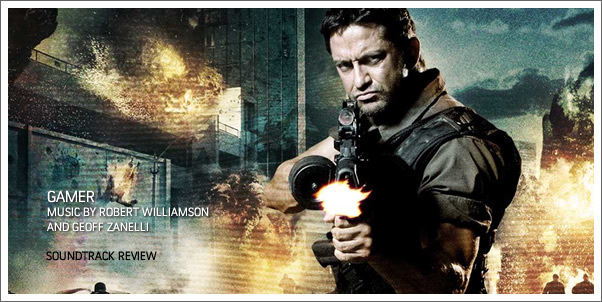 Whichever the case, in GAMER, the central is figure, Kable (Gerard Butler), a prisoner who get's to work off his sentence in a game called, Slayer. Now, this game is of the life and death sort. He also has a wife and daughter to find, who have been taken from him, but how does he win the game and save his family at the same time? It's such a pickle. In comparison, old Arnold had it easy when he won THE RUNNING MAN, since he at least had control of... himself. Poor Kable does not have this luxury, since he is merely the in-game-avatar of a teenaged-master-gamer, Simon. So off we go into this gritty, grungy, shaky, fleeting world of GAMER and to assist us into full migrane-inducing-immersion is the original score by ROBERT WILLIAMSON and GEOFF ZANELLI.